Some bloggers have been celebrating the passing of Bainimarama and AS-K supporters Sundip Patel and Lt Col Manasa Vaniqi. In doing so, they show themselves to be no better than Bainimarama and AS-K. Those who are calling their deaths a judgement from God need a reminder that they are not God. Russel Hunter did the right thing and admitted that Sundip Patel never interfered when he was editor and spent a lot of money fighting Hunter’s deportation. Sundip backed Hunter to try to increase the Sun’s circulation and then swapped horses in response to the deportation. In other words, it’s just business, the same story that RFMF officers tell their families when explaining why they backed a takeover by the military. And then there’s the late Lt Col Manasa Vaniqi. Like a lot of other military men he just did what he was told, but Bainimarama will find it hard to find another PS who will so blindly lead our sugar industry down the garden path to oblivion without a thought for what he’s doing. So let’s not blame Vaniqi for what’s happening to sugar. In the same context we should mark the passing of Crosbie Walsh as a commentator – not dead but he looks broken hearted. He’s been “left disturbed and puzzled by the resignation of former FNU Vice-Chancellor Dr Ganesh Chand”. And he finds the removal Acting Permanent Secretary of Education Ms Basundra Kumar “equally disturbing”. Cheer up Croz, we at least have a constitution and hopefully that will start to exert some discipline over Bainimarama and Sayed-Khaiyum. The Fiji Times is keeping them on their toes and who knows, maybe the Fiji Sun will have another change of editorial policy. Pro-democracy bloggers who blame the Bainimarama Government for the murder of an Australian tourist don’t do the cause of democracy any favours. As far as I’m aware the murder rate in Fiji hasn’t risen in the 8 years since Bainimarama seized power. It remains fairly low by world standards. If anyone has figures to disprove this please feel free to post them. I’m no expert but I do know murder is different to other crimes. Except in the worst crime hot spots, murders usually result from disputes between family and close friends. People don’t murder strangers for no reason and Fiji is not one of those places full of guns that commit half the murders. Thanks to the RFMF’s monopoly on guns, we don’t have guns making our crime problem worse. But Bainimarama is not blameless in relation to crime. Playing around with the police force – hounding a top professional Commissioner out of the country, replacing him with a local who has soon despatched and then installing an incompetent military mate who knew nothing about policing, and then replacing him with another military mate – all this did nothing to help make the FPF an effective professional force. The crime problem that worries us is the problem of burglary and home invasion and that calls for a properly funded, professional police force, which responds to calls for help. The random murder of a tourist should not be laid at the feet of Bainimarama. It’s the damage to the FPF we should be holding him to account on. Who would lend Frank $2.8 billion? People all around Fiji waiting to have water connected, or reconnected, or just to have some water in the pipes they already have, must be stunned to see the line-up for the presentation of Fiji’s case to the UN Human Rights Commission in Geneva. The group photo shows fourteen of them all looking very pleased with themselves. Fourteen! Who was this meant to impress? The UNHCR? The rest of us back home or around the world in more humble places? All we can see is a huge tax-payers bill for airfares and four star hotel accommodation at our expense. I can’t make up my mind what offends me most about this epic production. Is it just the AS-K ego tripping, which I guess I’ll have to learn to live with? Or is it the blatant contrast between all the fine words and the fact that the FPF still says they haven’t been able to catch the perpetrators of a crime that was filmed with many faces visible, not to mention a car registration plate. No police force has ever had handed to them a stronger case on a platter, crying out for charges to be laid. If people filmed were not direct perpetrators but are refusing to speak, charge them with being accomplices or obstructing justice. Whatever the UN Human Rights Commission may make of this circus of people jumping through process hoops, vaulting over bars set very low for themselves and juggling some big ugly facts, we all know a crime was committed and we all know the perpetrators are known to the Police. None of the fourteen can doubt that. Their appearance in this circus casts them as clowns at best and accomplices in human rights abuse at worst. Senior judicial figures from Fiji have told a United Nations gathering the country is addressing concerns about police brutality. 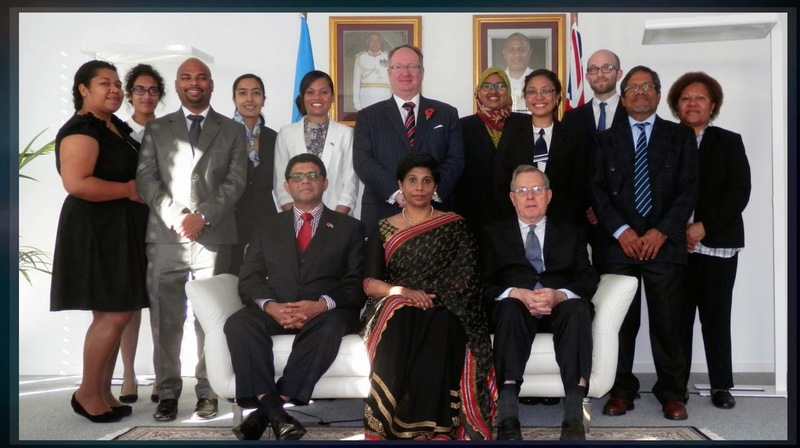 Fiji is undergoing a review of its human rights record under the United Nations Human Rights Council’s Universal Periodic Review. The Fiji delegation told a meeting of the Council in Geneva plans are underway for training police interrogators, videotaping their interviews with suspects and stricter procedures under a review of the Police Act next year. The Chief Justice Anthony Gates says the problem is due to a cultural misconception. Justice Gates says the judiciary is helping fund videotaping and interrogation training as courts waste much time having to resolve whether confessions have been given voluntarily. Members of Fiji police and military forces. In a story on the return of Fiji to the Pacific Forum, the Fiji Sun claimed “Fiji has been suspended from the forum since 2009 following the change of government in December 2006.” If the coup in 2006 was the reason for the suspension why did the suspension take place in 2009? What Fiji Sun is not telling us is that Bainimarama promised to hold an election in 2009 but reneged on that promise. He also promised to uphold the constitution and the rule of law but when the Appeal Court ruled that his overthrow of the elected government was illegal he threw out the constitution he’d sworn to uphold and sacked al the judges. Has Maika Bolatiki forgotten this or is he a shamless liar? Nowhere in that statement do I threaten a coup! The fact is, the Prime Minister and his side of the House and the 2013 Constitution are themselves the end product of the coups I referred to as the way we have been changing our political direction since 1987. This is a fact. Plain and simple. Opposition Member of Parliament Niko Naiwaikula today responded to alleged threats against him from Prime Minister Voreqe Bainimarama, as outlined in the Fiji Sun of 16th October. Honourable Naiwaikula said that Prime Minister Bainimarama and the Fiji Sun would do well to read the context in which I referred to coups in the Hansard – if they had, they would realize that their claims that I ‘threatened a coup‘ were not only baseless, but deliberately distorted to ‘sensationalize ’the issue for their own benefit of fear mongering. 4.It must also provide within it a provision that guarantees accountability, transparency and good governance. I will be so bold as to say that the sooner we convene a commission to look into and extract from all previous Constitutional documents, the good they have in them, combining them all into one that we all agree with containing those essential elements, the better it will be for us. This is clearly recorded in the Hansard records. By threatening me as he did, the Prime Minister himself is mocking the 2013 Constitution because he shows no respect or regard for my freedom of speech, expression and publication as stated in the Bill of Rights Sec 17, and my freedom of conscience and belief as stated in Sec 22. The Honourable Bainimarama must understand that he is now a Prime Minister, not a Dictator with a mandate to govern, he must exercise his powers with humility, respect and accountability and that includes allowing others to freely express their view and he must protect their right to do so.